L-R we have The British Flower Collective Members...James from Flowers by Clowance, Toria fromFlowers from the Plot, Becca from The Garden Gate Flower Company, Amanda from Amanda Taffinder Flowers, Thomas from Thomas Broom - the Florist, Mari from Roswartha flower farm, Sarah from Simply by Arrangement, Maz from The Garden Gate Flower Company, Tammy from Wild Bunch, Kay from Martin and the Magpie, Chloe from BareBlooms, Susanne from The Blue Carrot, Jay from Jay Archer Floral design. Image thanks to Lucy Wallace Photography. 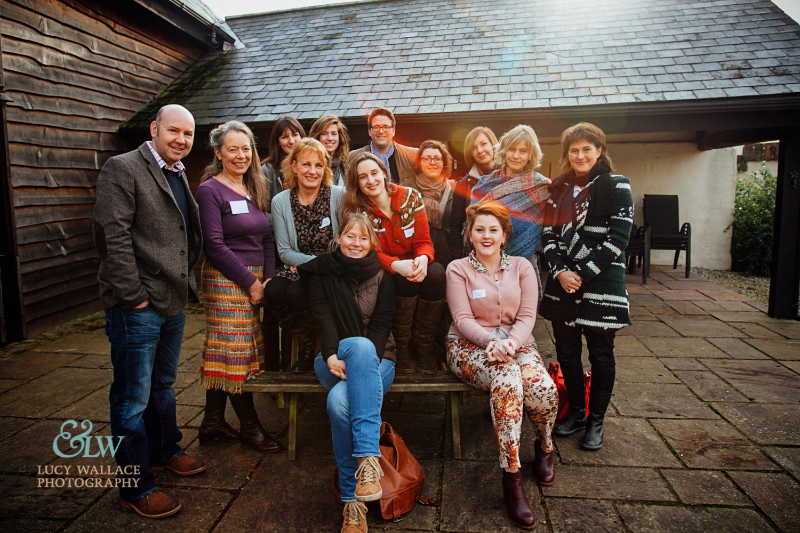 The beginning of February saw what has become an annual pilgrimage to Cullompton in Devon for the South West Meet up of flower farmers, florists and British Flower lovers. Organised by the south west representatives of Flowers from the Farm. Above you can see a lovely image by Lucy Wallace Photography of the British Flower Collective members that I could manage to round up/persuade to have their picture taken! After the success of last years idea to make a weekend of it in a self catering barn near by, I decided to book the barn again and invite other lovely flowery people to join me. The perfect way to make new friends. I've been taking advantage of the lull in wedding and gardening commitments to get out and about a bit visiting Members and organising meet ups. Left image top ) - Midlands Members meet up with Hannah from Bride and Bloom, Emily from Emily Wisher Artisan Florist, Carol from Tuckshop Flowers, Kathryn from Shelsley Herbs & Flowers, Breige from Flowers by Breige, Rachel from Catkin Flowers. We had a lovely meet up for some super delicious lunch at, the highly recommended, Fusca in Ryton on Dunsmore. 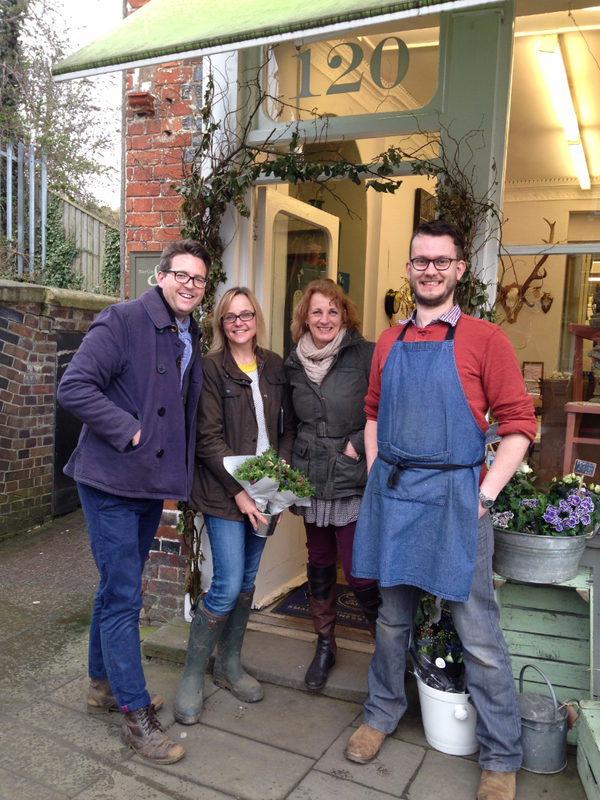 (Right image top) - Myself, Tom from Thomas Broom - the Florist and Lindsey from The White Horse Flower Company decided to drop in and visit Kay and Martin at their gorgeous shop, Martin and the Magpie in Hungerford. (bottom images) - Kay was kind enough to then take us to have a nose aroundMartin and the Magpies enviable walled garden where the sweet rocket (pictured) was looking very healthy and Blanche (Toms dog) did a fantastic job of photo bombing. Jo at Floral Circus has been very busy with her floral couture. Her winter shoot 'keeper of the trees' was featured over on Flowerona and check out this stunning Spring outfit by Jo. Jo is taking part in this years Chelsea Fringe. Chelsea Fringe is an alternative garden festival with a focus on community and inclusivity. it runs from 16th May to 6th June, spanning Chelsea Flower Show. It's billed as a funky celebration of all things horticultural where anything goes, the more creative the better. Chelsea Fringe pop up all over the country and beyond, even Japan! This year will see the first in Henley with a Floral Flotilla launching the festival on 16th May. Juliet of Babylon Flowers and Jo are going to be creating a community art project of suspended flowers from the bandstand at Mill Meadows by the river on that day, with schools getting involved making hand made flowers to tie within the installation. Jo will also be hosting an evening event of Floral Couture and Cocktails as part of the Chelsea Fringe. 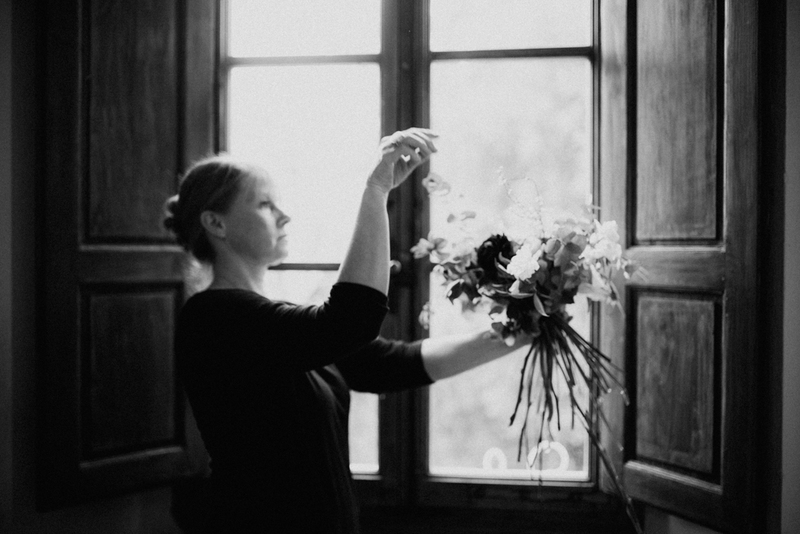 The British Flower Collective member Susanne from The Blue Carrot escaped the gloom of the British Weather to run a workshop with The Love Affair in Tuscany. You can read about it over on their blog, depending on how good your Italian is! The British Flower Collective Member Tammy from Wild Bunch was lucky enough to enrol on the workshop and she created the beauty below. We went to the garden one Sunday afternoon in late March to pick a posy of flowers to take to a friend's for tea. There was an open garden day at Stokesay Court, and the grounds were scattered with groups of happy people pottering about amidst the green and yellow clouds of wild daffodils. We opened the door to the walled garden and sneaked inside, locking it behind us. Everywhere were signs of life and loveliness to come – fat promising leaf buds on rose bushes and unfurling columbine leaves in the borders – but not many flowers yet for picking. We gathered a posy of speckly pink and white hellebores, starry cherry plum blossom, three stems of fragrant peachy stocks that had got ahead of themselves in the polytunnel, and a fistful of narcissi 'Thalia', still in bud. We've learned through experience that it is better not to mix narcissi with other flowers in the vase, as the leaky sap from the stems will kill the other flowers. However, blossom and hellebores have such a short vase life once cut that we thought it would make little difference; and Rosie would have the lovely scented, airy creamy white flowers of 'Thalia' to look forward to when the blossom was over. We wrapped the posy with torn sari silk and took it to tea. Rosie had made a magnificent Victoria sponge cake, and decorated it with primroses. 'Herbs and handties' with Rachel from Catkin - 21st April, 10am - 4pm. 'The Joy of Spring' Flowers Workshop' 02, with Tammy from Wild Bunch - 28th April, 10.30am -2.30pm. 'Flower farming for beginners' with Georgie from Common Farm Flowers - 29th April, 10am-4pm. 'Growing your own cutting garden from seeds and bulbs' with Claire fromPlantpassion - 29th April, 10am - 1pm. 'Posy tying and silver flower necklace workshop' with Common Farm Flowers - 5th May, 10am-3pm. 'Flower Crowns' with Claire from Garden & Wild - 31st May, 11am-3pm. 'Floral Couture and Cocktails' with Floral Circus - 3rd June, 7.30-10pm (part of the Chelsea Fringe). 'Posy tying workshop' with Common Farm Flowers - 9th June, 10am-2pm. 'Pick your own Posy' with Claire from Plantpassion - 10th June, 9.30am - 12.30 pm. 'DIY wedding flowers' with Common Farm Flowers - 10th June, 10am-2pm. Many of our Members, including The Garden gate flower company also offer bespoke 1:1 classes on request. As we near the end of the Hellebore season I am amazed that the hashtag#helleboreappreciationsociety that was started in winter 2014 on Instagram byThomas Broom and Lindsey Kitchin with myself quickly becoming honorary member followed swiftly by The garden gate flower company, etc,etc...... has snowballed this year and gone global with Erin from Floret even naming a blog post after it ! Isn't social media a funny, amazing thing! Carole from Tuckshop flowers will be part of the Flowers from the Farm stand at Gardeners World live this year at the NEC (11th-14th June). You can read about it over on her blog. Don't forget it is British Flowers Week on the 15-20th June. This year New Covent Garden Flower Market have set up a dedicated website with all the details. Watch this space for a new website from Thomas Broom - the Florist or is that Thomas Bloom ?!! Jay Archer launches the Jay Archer Floral Design flower school. I hope you have all had a restful Easter break and are enjoying the sound, smell and sights of Spring. If you are interested in becoming a member than please take a look at our websitefor details and a contact form.